I am rescued from having to write of Max Mosley's latest statement by Patrick Head giving his opinion on the Cosworth engine. The engine was last used in F1 by the Williams team and so he should know what he is talking about. And he does not agree that allowing the Cosworth to rev to 20,000 while the others have to stick to the current limit of 18,000 rpm will give it an unfair advantage. A little thought should answer any doubts of the 2006 vintage Cosworth being competitive with next year's engines. Normally, one would expect that three years of engine development in F1 would have quickly rendered the Cosworth obsolete but that argument ignores the engine freeze instituted in 2008. Theoretically at least, this means that engines have received no development for much of the time that Cosworth has been away. There have been a few changes, it is true, but these were supposed to have been made in the interests of reliability; we can guess that such adjustments have increased power only slightly (although Ferrari's tweaks seem to have adversely affected the reliability of its engine - strange that). Against this we should set the fact that the Cosworth was the first to get into the 20,000 rpm range and is no slouch, therefore. Bearing that in mind, it is reasonable to expect that the old lump would produce about as much power as today's F1 engines limited to 18,000 rpm, perhaps even a little more. Those who fear for the Cosworth's reliability in view of its higher revs should remember that it was reliable in 2006 and there is no reason why it should be any worse today. I think it is reasonable that the Cosworth be allowed those extra 2,000 revs, therefore. Taking Patrick Head's points regarding its heavier fuel consumption and the additional weight that implies in a series no longer allowing refueling during races, there will be a slight disadvantage accruing to the Cosworth teams. That fits rather nicely with history and tradition in the sport anyway. Customer engines were never as powerful as those run by factory teams and the old Cosworth DFV V8 was not able to equal the performance of Ferrari and Matra 12 cylinder engines, for instance. What made the difference for the teams using the Cosworth was its lesser weight and size that gave them more opportunity for playing with chassis design. And the result was a long string of Cosworth championships, as we all know. That history is unlikely to be repeated with the re-entry of Cosworth to the sport. On balance, the advantages and disadvantages end up with the engine being a slightly less competitive proposition than others in the game. It is possible that innovation and excellence in chassis design can make up that difference but no more than that. It is good that Cosworth is coming back, however. Aside from the nostalgia of those who remember the company's great achievements, it does mean that the range of engine choice is increased, thereby allowing F1 to maintain its variety, surely an important facet of the sport's appeal. Welcome back, Cossie! “...1988 marked the end of the turbo era. With a new 3.5ltr formula waiting in the wings for 89, FISA Presidente Jean- Marie Balestre vowed to equalize performance between the teams running the old 1.5ltr turbo technology and those, like Williams or Benetton, who had made an early switch to the bigger-capacity atmospheric engine. The governing body reduced maximum turbo boost from 4bar to 2.5 bar (cutting power outputs from 900 to around 700bhp) and reduced the fuel tank capacity that forced the turbos to run below maximum power (these were the days before refueling), would give the ‘atmo’ cars a better chance. While you make a reasonable case, Clive, it would appear that you're talking about two sets of rules here. And didn't that concept just get trashed? Don: True enough but it seems to have crept back in with this rev limit thing. There is a precedent for engines, however: in 2006 Toro Rosso were allowed to run the old 3 liter V10 Cosworth engine as a concession. So the concept is not new but was deemed inappropriate when related to budget caps. Yeah Clive, STR ran with the old V10 in 2006, but didn't they switch to a V8 engine a few rounds later? What I don't understand is, why these new teams picked up Cosworth engines if their engines are old? The reasonable answer is "cost cap", but shouldn't the FIA impose restrictions on Cosworth until they manage to catch up with the current 18,000rpm engines? Also, if what Patrick Head says about the engine size and fuel consumption being a trully handicap, why didn't they bought Ferrari or BMW engines instead? 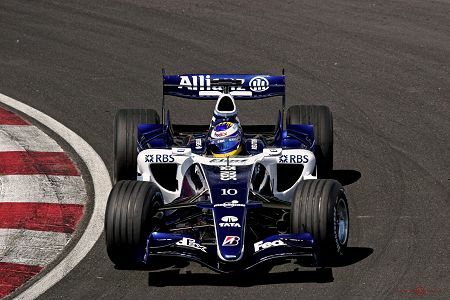 Guilherme: STR used the Cosworth throughout 2006. For 2007, Red Bull had the opportunity to get Renault engines and passed their existing deal for Ferrari engines along to STR. The use of the world "old" is relative in this context. The Cosworth 2.4 litre V8 is now three years old but, at the time, it was on the cutting edge of development (remember that the engine was the first to break the 20,000 rpm barrier). It is, perhaps, misleading to call them old even so, since the other F1 engines have been frozen in the meantime and are essentially the same now as they were in 2006. Effectively, all F1 engines are three years old in design at present. The new teams are going with Cosworth because they can buy their engines without having to arrange a deal with a manufacturer team. With the FIA/FOTA battle going on while these teams were looking for engines, it seemed unlikely that a manufacturer would look kindly on an application from a team helping to bolster Mosley's position by adding to his list of potential replacements for manufacturer teams. So it was a political thing but not unattractive anyway, the Cosworth being pretty much the equal of other F1 engines, as I have pointed out in the article. Cosworth will be as subject to the engine freeze as much as the other manufacturers and so cannot be expected to "catch up" with them if limited to 18,000 rpm - no engine development is allowed. The point of allowing them to rev to 20,000 rpm is to compensate for the small amount of engine development that Cosworth missed out on in 2007, the intention being that the advantages and disadvantages for the engine should more or less cancel each other out. This is ridiculous! To give this option to one company is just asking for trouble. Cosworth will make the rules work for them. They will develop the engine until they are sure it has an edge over the others at 18,000 then accept to be limited. To be given an opportunity to develop an engine while the others are frozen, if played right, will gain them an advantage. The only way to prevent this is to have honest people watching their every move. If you don't give everyone the same rules how can they possibly call it a fair competition at the end of the day. They asked Ferrari what they would like them to be, of course! I don't like the idea of the Cosworth not being limited. First of all, I'm not exactly fond of altering rules to allow newcomers (or reentries) to be competitive. I don't remember Toyota, for instance, getting any help, they had to try to make their way to the front of the grid legitimately, rather than having the rules made to balance out the relative lack of development/experience. Which would, I'd say, be a distinct advantage. I'd be more in favour of scrapping the rev limit in the first place though. Clive, thanks for the answers. I really didn't think about the political side of the matter. And really sorry for using the "old" word. That's not what I really meant. My point was that if they bought manufacturer engines, they would avoid this trouble about rpm limits. But know that you remembered me of the relationship between the FIA x FOTA bickering and these engine deals, it makes perfect sense. Nick: Except that Cosworth will not be allowed to develop their engine, just as the other manufacturers' engines will still be frozen. We should remember that these are the engines as they were when frozen at the beginning of 2007 and they are all capable of revving to 20,000 therefore. The FIA would be setting the rev limiters at 18,000 except for the Cosworth, which will be allowed 20,000. Although it is not ideal to have a different setting for one engine, it is necessary to adjust the balance between the engines to take into account the small amount of development that the manufacturers have managed by taking advantage of the rule that allowed changes if made for reliability purposes. Without this allowance, the Cosworth would not be a valid alternative for teams looking for a power plant. I think it's an acceptable anomaly as an interim measure, rather like Toro Rosso's concession of using a V10 for a year while everyone else went to the V8. Leslie: LOL, you're probably right! Mr Soap: I would be in favour of scrapping the rev limit too but even the teams seem to accept it as a necessary curb on the arms race. And the "rev limiter ruining overtaking" argument does not really wash since the Cosworth will be limited too. Each team uses gear rations according to the limits of its engine and the Cosworth will have no advantage in top speed as a result. The power is spread between the ratios to optimum advantage (if the team is getting it right) and the manufacturers will use a higher set of ratios than the Cosworth teams therefore. The net result will be that, at the expected top speed achievable on each circuit, the Cosworth will be revving at a shade less than 20,000, the manufacturers' engines at just short of 18,000. The rev limiter only interferes with overtaking when the team gets the gear ratios wrong and the car can actually go faster on the particular track and in some circumstances than expected. Guilherme: No problem. Actually, I used the word "old" first - I called the Cosworth an "old lump" in the article. In context, it was intended as a term of endearment rather than a reflection on its age relative to the other engines, however. I am wary of the idea of two different standards as I was with the budget cap and now this. I hate to change the subject but curiosity has gotten the better of me, who are the people calling for Mosley to stay in power? How could he have the support of delegates considering his efforts to kill the sport almost led to its implosion? I just don't understand I guess. The Tru7h: Mosleys support comes from the caravan towing clubs of places such as Zaire & Bungonia. You'll see the president of a similar club at a GP soon, he'll be one of the FIA stewards on a jolly. The Tru7h: Leslie has it correct - Max's support comes mainly from the smaller motoring organisations who receive considerable monetary assistance from the FIA and hesitate to endanger that by voting against the present president, therefore. In the vote of confidence last year, we saw how the votes of huge organisations from America and Europe were outnumbered by those of the myriads of small fry; it's one delegate, one vote, regardless of how many people each delegate represents. It is also relevant that so many delegates represent motoring clubs and have no interest in motor sport. They tend to do whatever Max says as a result. Such a ridiculous situation is caused by Max having amalgamated the old FISA into its parent body, the FIA, years ago. When FISA ran F1, its members were motor sport people but now the FIA delegates run the show and most of them could not care less about the sport. There seems to be some confusion (surprise surprise) about the cossie rev limit. "There will be only one set of rules for everyone and that means the the notion of running Cosworth engines at 20,000rpm to make them more competitive is out of the window." I seem to recall MM saying cossie could not get down to 18k in time for 2010. Do you have any more info on this Clive ? DWinn: There are indeed conflicting stories as to whether the Cosworth will be allowed a 20,000 rpm limit. It is one of those things still to be settled, I think. FOTA seems quite amenable to the idea so it would seem that James is guessing when he says there won't be that concession made. Peril: That is true but I'm not sure that all Mark's retirements were the result of failures of the Cosworth engine. One should also remember that engines were being strained to the utmost at the time in the quest for more power and so there were bound to be a few failures. A rev limit instantly ensures that reliability will improve since it prevents the engine from going to the extreme end of its capabilities. The Cosworth revved above 20,000 and limiting it to just below that figure should help it at least a little. A rev limiter indeed improves the reliability of the engine, but now they must last longer than in 2006. Perhaps we'll see Cosworth engines blowing up often in their third races, since they will be more stressed than 18.000 rev engines. Guilherme: Good point - you could be right!